With PSY’s hit topping the charts in the UK and the USA, I am wondering which pencil is the ultimate Gangnam Style pencil – luxurious, but also a bit crazy. A hot contender is the Monami MP-4003. Luxurious, but also a but crazy? Yes, but maybe a bit too kitsch. Decadent? Yes. Even hedonistic? Probably not. If the Empire State Building was in Korea, some might call the MP-4003 the Empire State pencil. 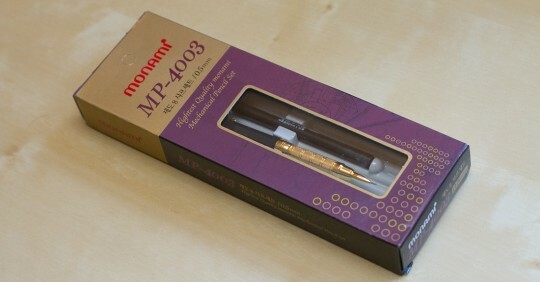 The Monami MP-4003 comes in a nice-ish plastic box and is accompanied by a nice lead container. Quality-wise you can see that the accessories that come with the pencil are not top class: the plastic box had a broken off corner and the lid of the lead container had a crack, probably not because they weren’t handled probably, but because of the materials used. The quality of the pencil itself is better than that of the accessories, but if you look closely, you also notice very minor problems – like scratches on the surface of the plastic body, marks that might be sprue marks or problems with the friction fit of the cap, which is too tight …at least in the case of my pencil. The look of the pencil is fantastic, even though they have overdone it, at least for my Western taste. The knurled grip works well, but could maybe have a bit more grip. It feels like knurled for effect, not knurled for purpose and the knurled section also starts rather far away from the tip. The cap gets wider towards the end. Something I like very much, probably the main reason why I like the Yard-O-Led Edwardian pencil or Graf von Faber-Castell and Faber-Castell Perfect Pencils with this design. There is a lead hardness indicator, but oddly enough the only grade printed on the body is “HB”, which makes it nearly useless. One possible use might be to set it to “HB” for HB leads and to the black colour of the body for anything other than HB. Speaking of HB leads: the leads that come with the pencil are very soft and dark for HB leads. Monami, the manufacturer, seems to be Korea’s biggest stationery company, but according to Kent almost all of their wood-cased pencils are cheap pencils for children with cartoon characters printed on them. I couldn’t find this pencil on their web site, but that doesn’t necessarily mean it is not being made any more. As far as I can tell my pencil was manufactured in 2011. Value for money is good, with the price of this mechanical pencil being similar to most other mechanical pencils. I paid $6.50 (£4; €5) plus shipping on an auction web site. Keeping in mind that this pencil has more ‘metal’ on its body than most pencils in this price range makes it a very good price. 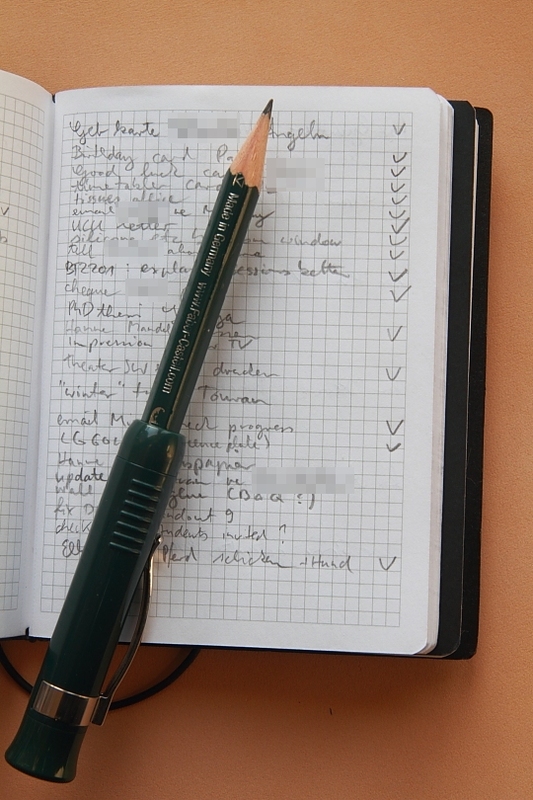 You can admire the MP-3003, IMHO a nicer, because silver coloured, version in Gunther’s virtual pencil case. If the MP-4003 isn’t over the top enough for you, have a look at the Micro HEXA 10000 (again in Gunther’s virtual pencil case). It looks like a Pharao’s mechanical pencil with the grip of the Faber-Castell TK_Fine Vario.